D. Blake Werts and David Miller are back with kind thoughts in memory of Clay Geerdes, journalist, teacher and mini comix publisher. Landing in mailboxes this week is Copy This! #26, the Clay Geerdes Tribute edition. After Blake’s intro, Clay’s Newave Manifesto is reprinted. Then on to the main event—fond recollections and a little history presented in prose and comics form from R.C. Harvey, Bruce Chrislip, Jim Siergey, Clark Dissmeyer, Jim Valentino, J.R. Williams, Par Holman, George Erling, Jim Ryan, Bob Vojtko, Steve Willis, Brad W. Foster and David Miller. This 68-page monster mini also includes artwork by Howard Cruse, John Howard, Jim Siergey, Jim Valentino, Clay Geerdes, George Erling, Bob Vojtko, Brad W. Foster, David Miller and Dan W. Taylor. The cover is by Clay with title work by David Miller. David Miller also announced the addition of two new installments to The Clay Geerdes Archives blog. 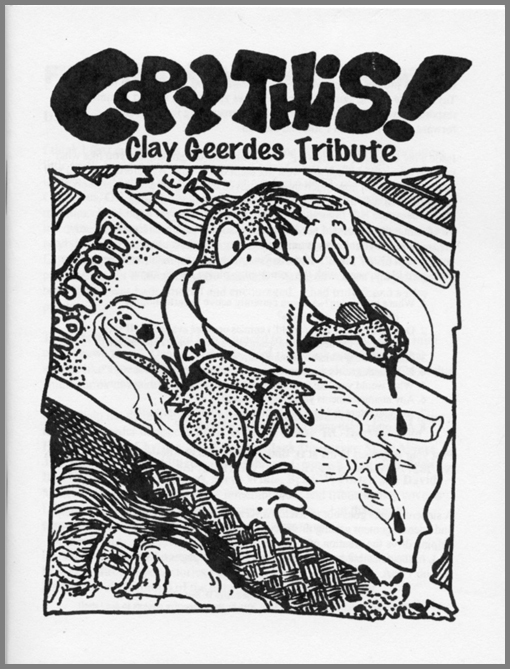 David’s next project is to focus on Clay’s many photographs of Underground Cartoonists. Lastly, there is a new humor magazine out with its second issue in development, called The American Bystander. See their Kickstarter Campaign for #2 for who’s in it and what it’s all about.